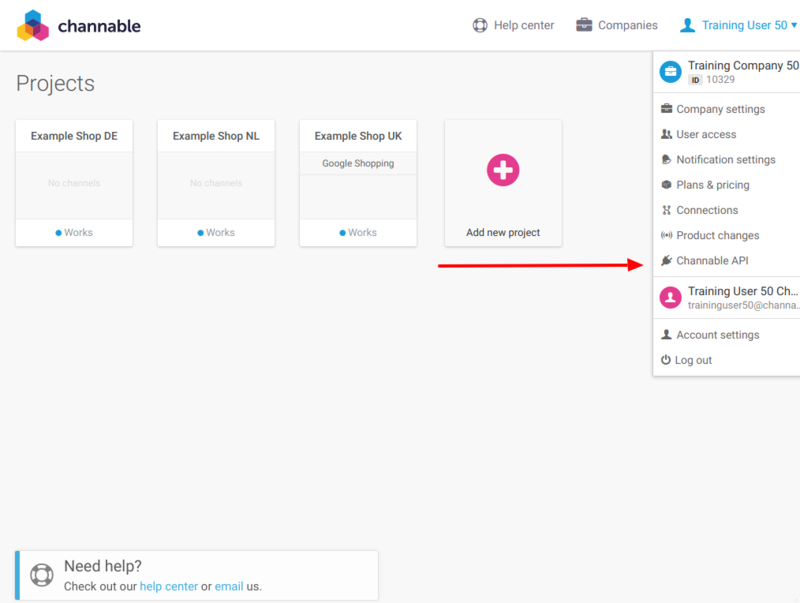 Welcome to the Channable API v1. The Common Path is shared by all endpoints in this version of our API. Note that you have to replace :company_id and :project_id with valid values. Platform A webshop platform, such as WooComerce, Lightspeed, etc. Marketplace A place where you can sell your products, such as Google, Amazon, eBay, etc. Sometimes referred to as channel. Order A purchase of any products made by a client. Offer A selling proposal made by a seller over any class of products. It includes price, stock and other seller-dependent values. The Channable API has a rate limiting policy to which you must comply to. It is defined on a per-company basis, meaning that generating new API tokens will not circumvent our rate-limiting. Note: We use the Leaky Bucket algorithm for rate-limiting. 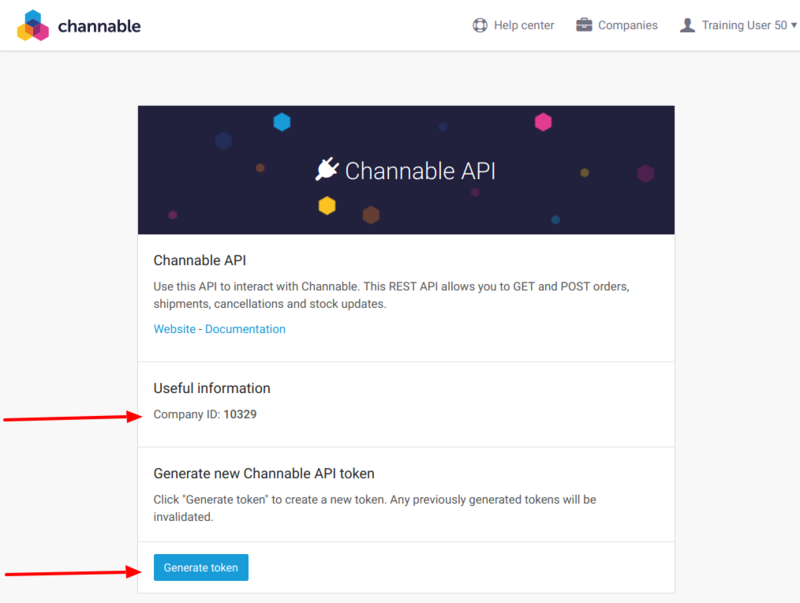 To both find your Channable company_id and to generate a new API token for your company, go to app.channable.com and sign in. Only owners of companies are able to generate an Api Token. Channable does not store your tokens. Please store them securely. In case you lose or leak your token, generate a new one. The previously generated tokens will be automatically revoked. The API Token is on a per-company basis and should be shared within your company. Do not generate a new API Token in order to provide one to another member of your company. You must include your API token in every request you make to Channable. You must replace your_api_token with your API token. "memo": "Order from Channable \n Bol.com order id: 123\n Customer receipt: https:\/\/www.bol.com\/sdd\/orders\/downloadallpackageslips.html"
This endpoint retrieves all orders for a given project of your company, sorted from most recent to oldest. Optionally, you can pass query parameters to customize the query and response content. Note that the order data itself (like address information) can not be modified. offset Int 0 Defines the starting position, in which position 0 resembles the most recent order. limit Int 15, max = 100 The number of orders to retrieve after offset. search String empty Search term used to filter the orders list. errors Bool False Choose to only retrieve orders with errors. Note: true, True, and 1 evaluate to True, everything else is considered False. orders: the selected list of orders, sorted on the created timestamp. You can see at your right a real example of such return value. This endpoint retrieves an order, and its events, based on the order_id. The first is more used in the Netherlands, where an address requires a house number, while the second version is more used abroad. We support both cases, and, in the example to the right, you see how to translate one into the other. An order contains a list of products purchased by a customer. The product.quantity stores the quantity of products of a given kind were purchased. The product.price is per product, not product.quantity * price_per_unit. The order.price.total is the sum of all purchased products' price, shipping costs, and other applicable fees. This endpoint allows you to update an order shipment status. We will then propagate the update to the involved marketplaces. message String "Processed 1 shipment"
This endpoint allows you to update an order status and set it to cancelled. We will then propagate the update to the involved marketplaces. Note that this only covers the case where the seller wants to cancel an order. If the buyer cancels an order, the marketplace requires the seller to manually confirm this cancellation in the marketplace seller account. message String "Processed 1 cancellation"
This endpoint retrieves all offers for a given project of your company, sorted from most recent to oldest. Offers are the product updates that you posted. These are found under "Orders" > "Product updates" in the Channable tool. Optionally, you can pass query parameters to customize the query and response content. limit Int 15, max = 100 The number of offers to retrieve after offset. search String empty Search term used to filter the offers list. This endpoint allows you to update the offers' stock of a selected project. We will then propagate the update to all the marketplaces of the targeted project. content list containing the result of updating each offer, per marketplace. "comment": "De schoenen vielen te groot." This endpoint retrieves all returns for a given project of your company, sorted from most recent to oldest. limit Int 15, max = 100 The number of returns to retrieve after offset. search String empty Search term used to filter the returns list. This endpoint allows you to update a return status. We will then propagate the update to the involved marketplaces. Depending of the return status the end customer does or does not get their money back. The return_id is the Channable id of the return. accepted Accept the return, the end customer gets their money back. rejected Reject the return, the end customer does not get their money back. repaired The product is repaired and send back to the customer, they do not get their money back. keeps The customer keeps the product but does get their money back. exchanged A different product is sent to the customer, they do not get their money back. cancelled The return is cancelled, the end customer does not get their money back. "message": "Processed 1 return status update"
message String "Processed 1 return status updates"
"message": "explanation of what went wrong"
401 Unauthorized You are using an invalid or already revoked API token. 403 Forbidden You are not allowed to access the resources your request targets. 404 Not Found The targeted resources could not be found. 405 Method Not Allowed You tried to access an endpoint with an invalid HTTP method. 406 Not Acceptable You requested a format that isn't json. 409 Conflict Your request could not be completed due to a conflict with the current state of the target resource. 422 Unprocessable Entity We could understand the content type of the request entity, but we are unable to process the contained instructions. 429 Too Many Requests You have sent too many requests in a given amount of time, thus exceeding our rate-limiting policy. Please try again later. 500 Internal Server Error We had a problem with our server. Please try again later. 503 Service Unavailable We are temporarily offline for maintenance. Please try again later.